I like to grow a lot of milkweed plants in my garden, as milkweed is the only larval host for Monarch Butterflies, whose famous multi-generational migration across North America is sadly in danger of going extinct. While many are familiar with milkweeds sold in nurseries, such as Tropical Milkweed, Rose Milkweed, and Butterfly Weed, there are actually many different types of milkweed plants. 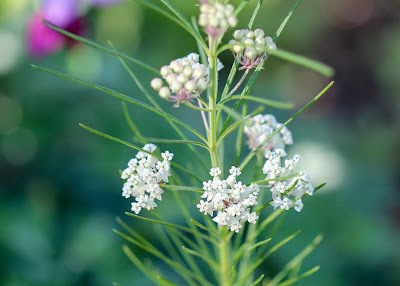 One that is a little different and blooming in my garden this year for the first time is Asclepias verticillata, aka Whorled Milkweed or Horsetail Milkweed. Asclepias verticillata has thin, very narrow leaves, different than most other milkweeds. It grows to about 1 or 2 feet high, with umbels of white flowers and leaves that are whorled around the stem, giving this plant its name ('verticillata' is Latin for 'whorled'). Whorled Milkweed is native to eastern and central North America, found in dry prairies, open grassy woodlands, and areas of disturbed soil, such as fields and roadsides. It likes full to partial sun, grows in medium to dry soils, and is hardy from zone 3-10. It is a good milkweed to grow on a dry, difficult site, as it is quite drought tolerant once established. 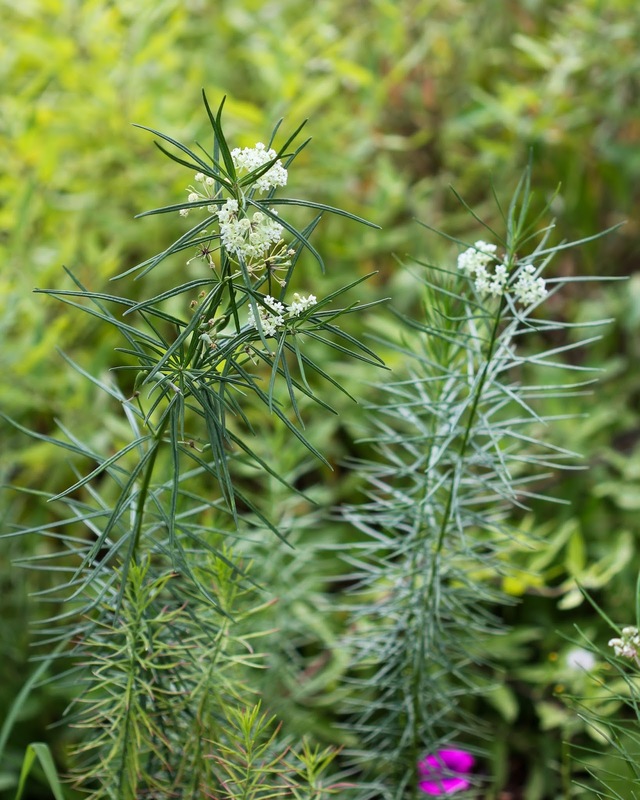 With its narrow stems and leaves, it's one of those plants that I think would work well with other low perennials and grasses. It blooms mid-summer through fall, a little later than other milkweeds. It is also one of the last milkweeds to go dormant, making it an important source of food for Monarch caterpillars late in the season. Whorled Milkweed spreads by seed and by rhizomes. I grew my plants from seeds by winter-sowing, as the seeds need a period of moist cold to germinate. It is one of the more toxic varieties of milkweed, so it is very critter resistant (more so than my Rose Milkweed this year, which I think is being eaten by a very mischievous groundhog). Accordingly, it should not be grown anywhere near livestock that might eat it. 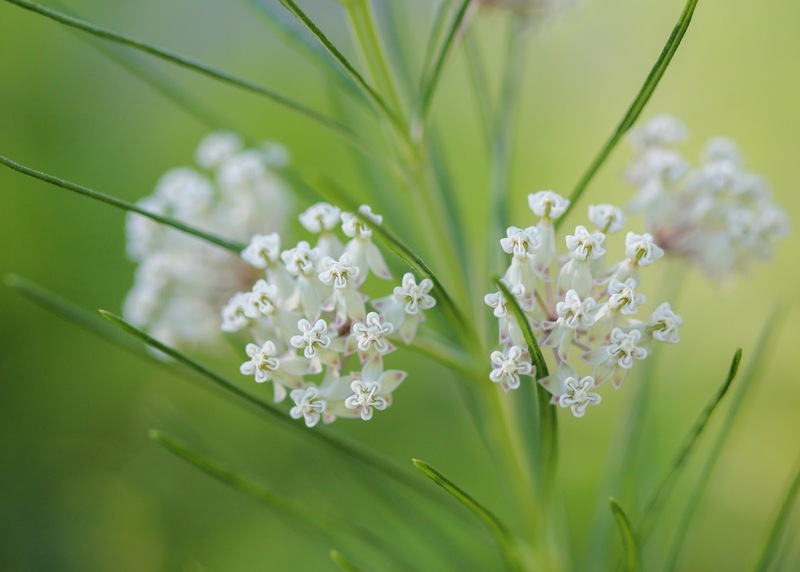 The white flowers attract bees, beneficial wasps, moths, and butterflies, though they are not as fragrant as some other milkweeds. Because of their long history of use as medicinal plants, Carl Linnaeus gave milkweeds the botanical name of 'Asclepias' after Asclepias, the Greek god of medicine. 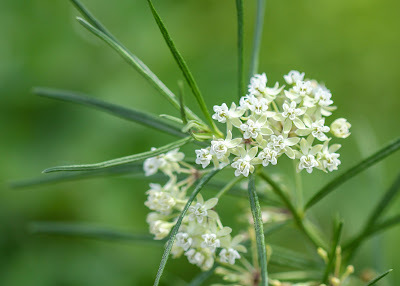 Whorled milkweed is no different, historically used by several Native American tribes to treat snakebites, to relieve nose and throat problems, and to increase the milk of nursing mothers. I really like the airy look of Whorled Milkweed in my garden. It is a great alternative to the orange-flowered Butterfly Weed for a dry, sunny site - especially in my more pastel-themed front yard garden. I look forward to watching it grow and seeing if it attracts any late-season Monarchs. That's pretty awesome! I'm hoping my little stand will seed around a little bit so I can get more. It's nice that it is lower than my other milkweeds. Thanks for posting this, Indie--a friend gave me some seeds last year, and I had forgotten all about them. Maybe the plant I thought was a weed is this milkweed. I sure hope so! That would be nice! It didn't flower for me until its second year, but I neglected it and had it in seed trays for all of its first year, so I don't blame it! A beautiful plant! Thanks for the introduction. You are very welcome! I really like this one, and not as many people seem to know about it. Keep us posted on the Whorled Milkweed. I looked it up after you first mentioned it and, best I can remember, it had a tendency to be invasive which always scares me. I've read conflicting reports on how aggressive it is. It doesn't seem to be as aggressive as Common Milkweed, but some say it will spread a lot if you have dry, sunny open soil. It might be a bit much for a small garden if you have dry soil like that. Always a good thing to check! Milkweeds are such a varied group I'm always amazed at the number of types out there. You could easily have a garden filled with them and I'll have to keep my eyes open for this one! I saw a list once of all the different milkweeds native to each part of North America, and I was quite amazed at how many different varieties of them there are! I like the leaves on this one a lot. Great post! I've tried to grow this milkweed, but it has faded away in our garden. Not sure why. That's too bad! It seems to really like it on the dry side, so maybe you get too much water there? I have it growing under a flowering crabapple tree where it still gets some sun but stays quite dry. We'll see if it survives to next year! Kudos to you for caring about monarchs and other small garden creatures that are endangered because of diminishing habitat and human use of pesticides. Your garden is a beautiful example of how a garden can be attractive and beneficial to both wildlife and humans. Thank you - that is exactly what I strive for in my garden! This is a lovely milkweed, new to me. Where did you get seeds? I ordered them online from Prairie Moon Nursery, which is a nursery that sells native plants. They have both seeds and bare root milkweed plants for sale. Thank you! Most asclepias are native to the Americas, I believe, so it might not be a plant you normally see over there. I love the look of this milkweed too Indie....I will have to add it with other milkweed. This one is a little different, with its thin leaves, which is nice. 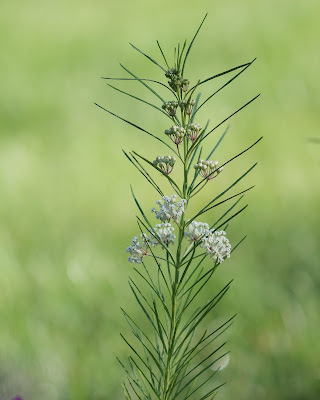 I came across this blog post while trying to figure out if it is too late to plant whorled milkweed seeds in our zone 6ish SE Nebraska yard. I have a few plants, but they have been declining instead of spreading. I didn't realize they are more toxic than other milkweeds. Maybe I shouldn't plant them on the edge of a flower bed, where I was planning to, since my granddaughter, who will be 4 in June will have frequent access to that area. If you don't think you have enough cold period to germinate them before summer, you could always put them in a baggie with some damp sand and stick them in the fridge for a month before planting. At least your granddaughter is probably past the age for putting them in her mouth, but some people are allergic to the sap, so if she'll want to pick them, an area out of the way might be better. Good luck with your stand of milkweed plants!